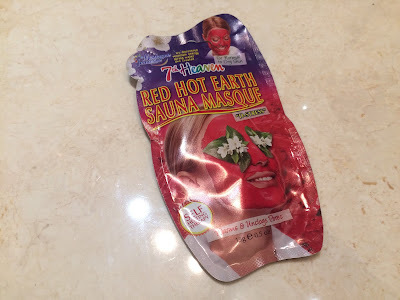 I love a good face mask, and I love a self-heating one even more - and I got a load of 7th Heaven masks in a big Christmas bundle from Tessuti, so when I was digging through and noticed the red hot earth sauna masque I was so eager to shove it on my face. It's marketed for normal-dry skin, which I definitely have, and claims to unblock pores, which I definitely need. It has lime, grapefruit and jasmine in it which overall makes it smell a bit like a watermelon cocktail, which is pretty nice. It's made with red clay which is incredible for the skin so I was pretty excited to see what it would do for me. I left it on for the recommended 15 minutes, and it didn't go all solid and weird like a lot of face masks do - not a sensation I enjoy, really, so that was good. It heated up immediately on contact with the skin and actually stayed warm for most of the time I had the mask on which I was so impressed with. It definitely reduced some of the redness in my skin and while I don't think it cleared my pores out much, overall my skin did look better, brighter and cleaner. It still felt soft the next morning, if a tad greasy on my head - but not so much so that it would put me off! A lot of clay masks are quite drying but this one is a dream. It smells good, it works, and it's cheap; what more could you ask for?! You can get these masks in all sorts of places and they have so many variations, including loads of new ones like cuticle/nail masks, foot packs, and more!